In a small and crudely painted green room called “the bunker,” 18-year-old Lucas dos Santos da Cruz and his friends go over rhymes in their heads. 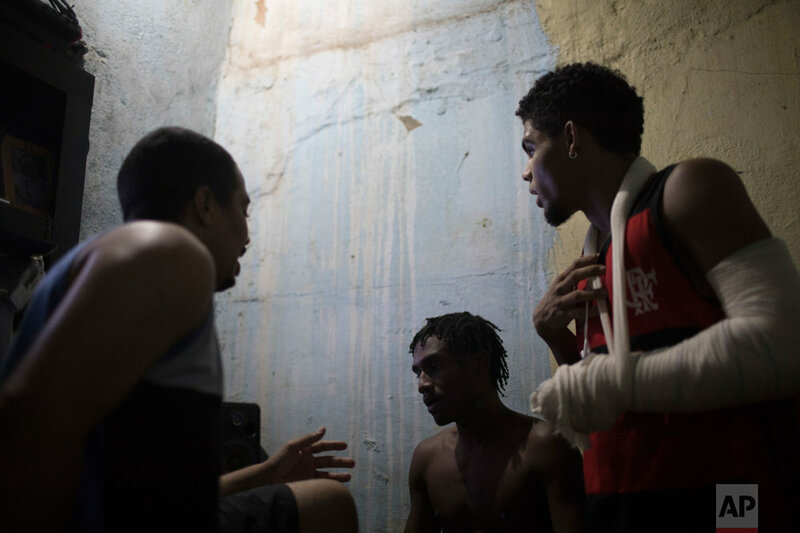 Soon they will be competing in freestyle rap battles on a poorly illuminated square in the “City of God,” one of Rio de Janeiro’s most notorious and violent slums. For the young men, rap is a way to express frustration with the violence that permeates their daily lives. To see how residents were dealing with an increase in violence in Rio’s favelas, an Associated Press team spent eight days with two families in the City of God, which was made famous by the 2002 Oscar-nominated film by the same name. Just a few miles from the Olympic Park, where the 2016 Rio Games were held, the slum offers few government services and shootouts between police and heavily armed drug traffickers are common. While many teens participate in rap battles to deal with the stress of violence, others cope by learning a musical instrument, participating in capoeira dance circles or taking university prep classes in a community center. Still others create art or try to serve the most downtrodden among them, doing activities ranging from volunteering to cooking and offering free meals. Employees of the center haven’t been paid in three months, a situation common for thousands of workers in Rio state agencies. The center has remained open thanks to an extraordinary effort of volunteers, who believe closing it would be a devastating blow. Isabela Maia, 10, says she gets nervous when her mother makes her and her 2-year-old sister come inside during a shooting. Her outlet is learning to play the violin. “Music calms me down,” said Maia, who practices each afternoon after doing her homework. Robson Luiz de Mendonca, 46, knows firsthand how life in a favela can consume loved ones. His son, 24, died in January of pulmonary problems after a crack addiction for many years. “Residents of City of God are in a hurry — in a hurry for identity, in a hurry for dignity, in a hurry for true action, but (the government) does nothing,” said Mendonca, who is known in the neighborhood as MC Mingau thanks to his rapping and teaching of breakdancing. Anayde dos Santos Muniz, 84, holds in her hand two bullets that she says recently hit her house near her bed. Singing, painting and writing poems and songs are outlets for her to deal with the violence. Text from the AP news story, AP PHOTOS: Music, art help del with violence in Rio Slums, by Yesica Fisch and Leo Correa.